Discover the darker side of the historic market town of Royal Sutton Coldfield. This informative and entertaining tour will include plenty of stories of ghosts, mysteries and foul deeds – from Roman legions to Victorian murders. Our route will take us from the atmospheric Sutton Park (bring your own torches) to haunted pubs in the town centre, with plenty more spooky spots to discover along the way. 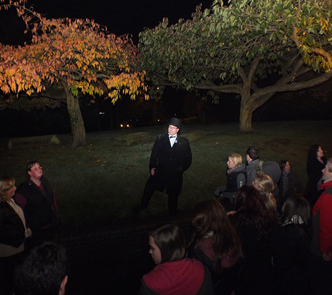 Our public Sutton Ghost walks take place on the 2nd Friday of January and April. They start at 7:00 p.m. sharp from the Town Gate entrance to Sutton Park. The walk lasts around 2 hours and will finish close to the train station. Tickets for our regular monthly and occasional tours can be obtained online from WeGotTickets (no booking fees). To see the start location for this walk on google maps, click here.